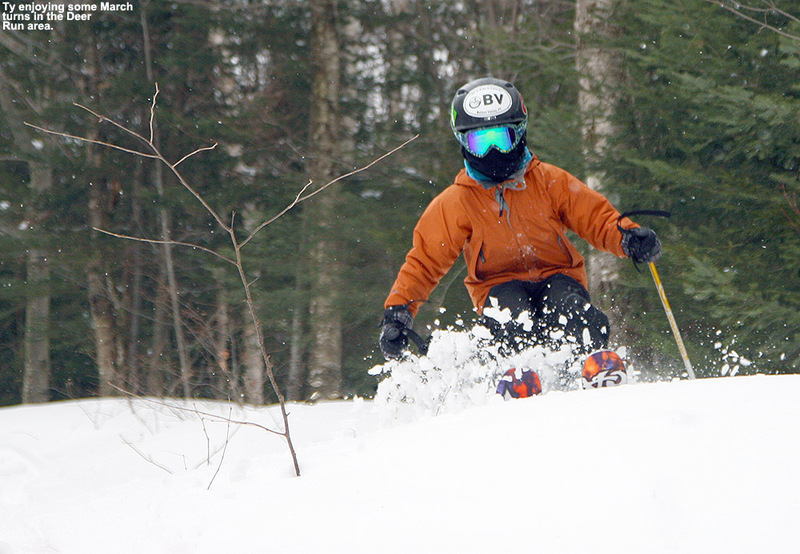 The glades on Dewey Mountain held some fantastic Champlain Powder today. I’m sure there are many interesting stories that begin in a dark room, but in this case, the story begins in a darkroom. It was early June of 2010, and I was in the Pharmacology darkroom on the third floor of UVM’s Given Building. It must have been a popular day for western blotting, because I was in there with another guy as we both queued up some films for the developer. 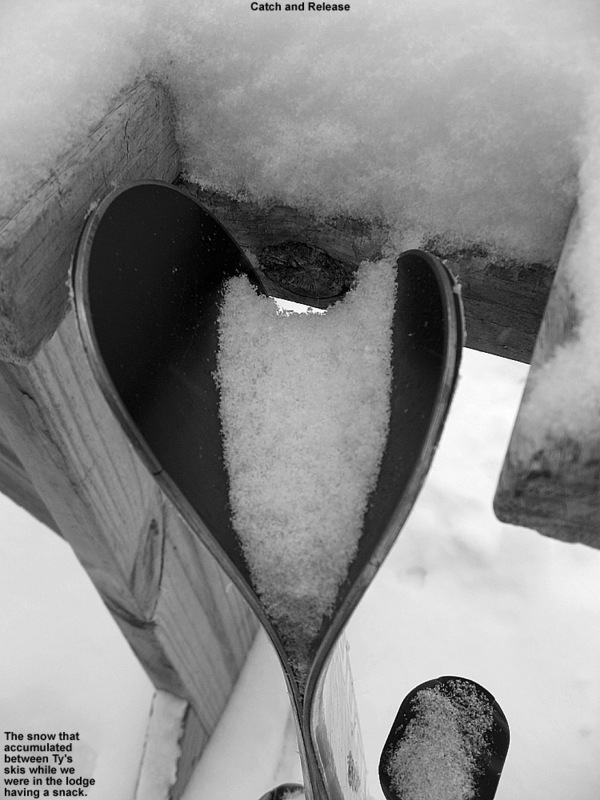 I can’t recall his name, but I think he knew I was a skier, and as he was as well, the conversation almost inevitably migrated in that direction. As backcountry skiing was discussed, he told me that I should check out the west face of Dewey Mountain sometime – he said you just drive up to the top of the road, put on your skins, and go up. It all sounded pretty straightforward from what I could tell. Being well entrenched in the warm season at that point, there was of course no way I was going to run off and check it out anytime soon, but I made a mental note and figured I’d check it out at some point in the future when the time was right. As one might expect, things happened to align, and that time was today. 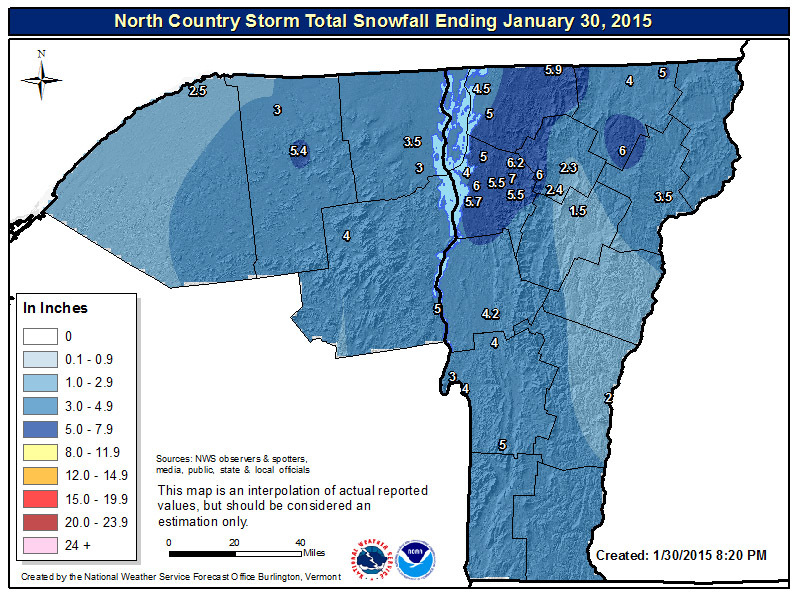 Our most recent snowfall in the Northern Greens came yesterday from Winter Storm Kari; it wasn’t an especially big storm up here, but much of the Champlain Valley picked up a half a foot of snow, and the west side resorts like Bolton Valley and Smuggler’s Notch received more than a foot. While yesterday’s temperatures were quite pleasant (and the skiing fantastic from what I hear), the storm pulled down more arctic air and was back into highs in the single digits F for the weekend. 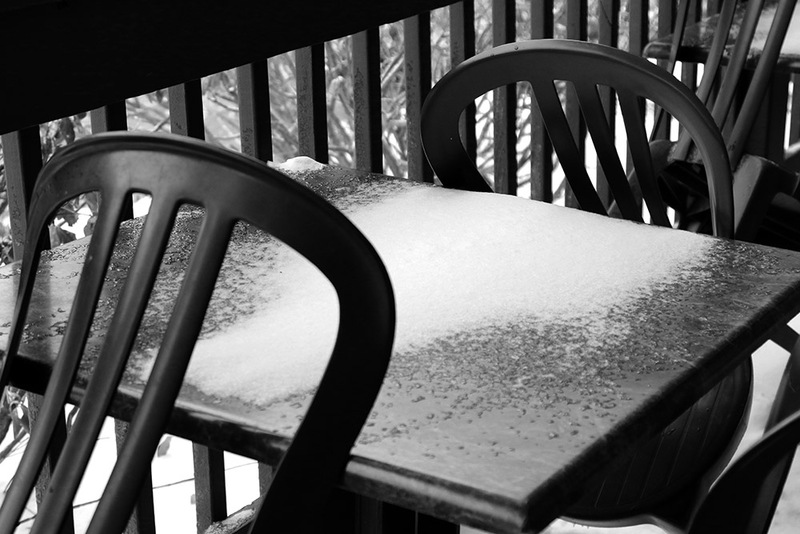 Combined with wind, temperatures would be well down into the negative numbers, and E and the boys had no interest in going out in that. 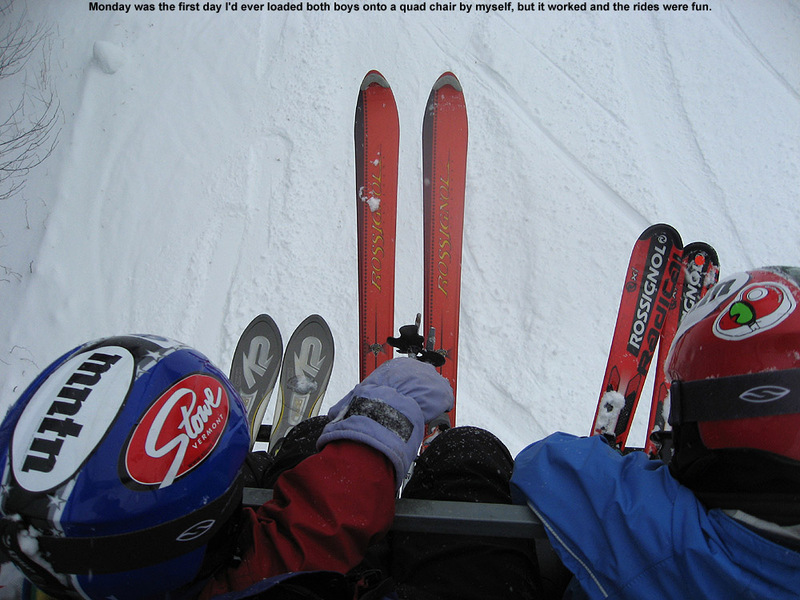 I didn’t really feel like riding the lifts in those temperatures either, so another backcountry day was calling. I’d been a bit leery to head to the western slopes with the way they were lagging in snowpack earlier in the season, but with the way they cleaned up in this most recent storm, it seemed like the time had come. I had enough time to head out toward Underhill, so I figured I’d finally head to the top of the road and see what Dewey Mountain had to offer for snow and terrain. 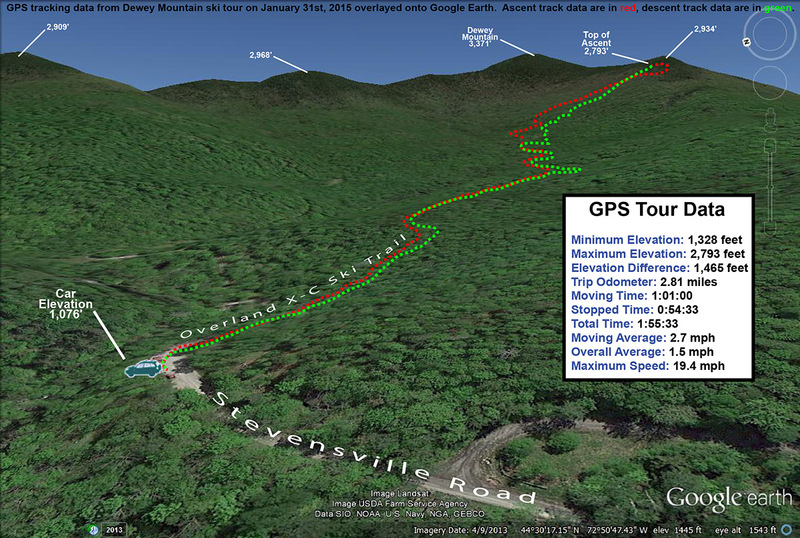 It turns out that “the road” that you head to the top of, is Stevensville Road coming out of Underhill Center. 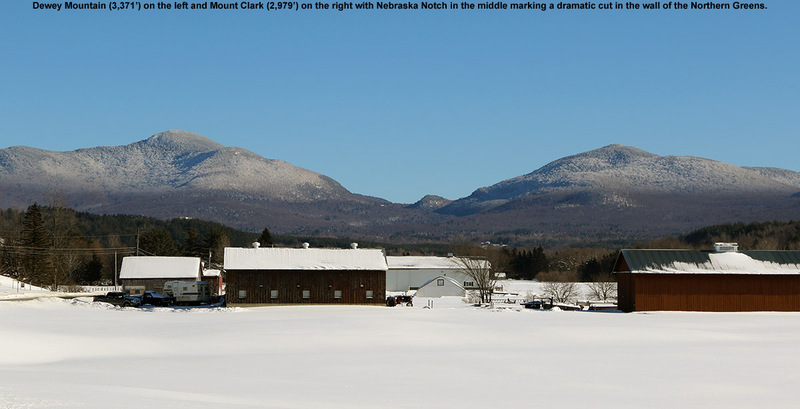 There’s a fairly large parking area there, and I’d actually just visited it this past fall when Mark and I did a shuttle hike up to the ridge line of Mt. Mansfield and down to Underhill State Park. 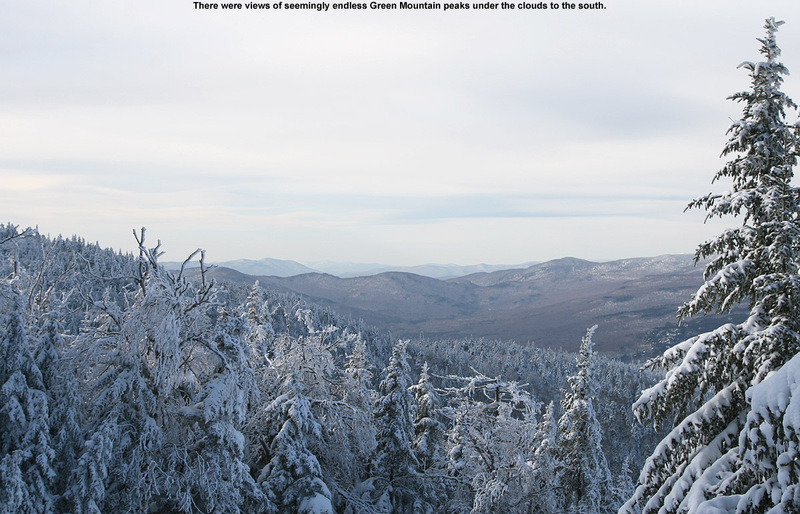 I’d never been there in the winter though, and it was an interesting drive. 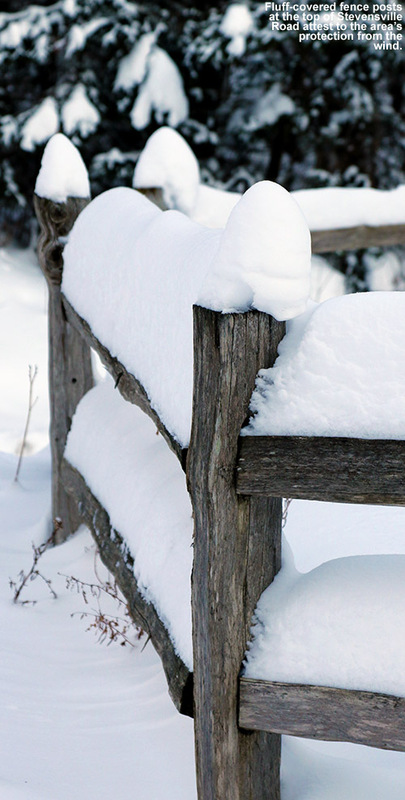 Even though this past storm wasn’t a big one, as I got into the upper elevations of Stevensville Road, I could see that they had a ton of snow, and it looked like a mini fluff bomb had gone off in the area. 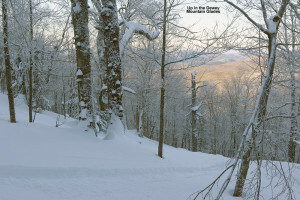 Delicate upslope Champlain Powder™ snow was piled on everything. 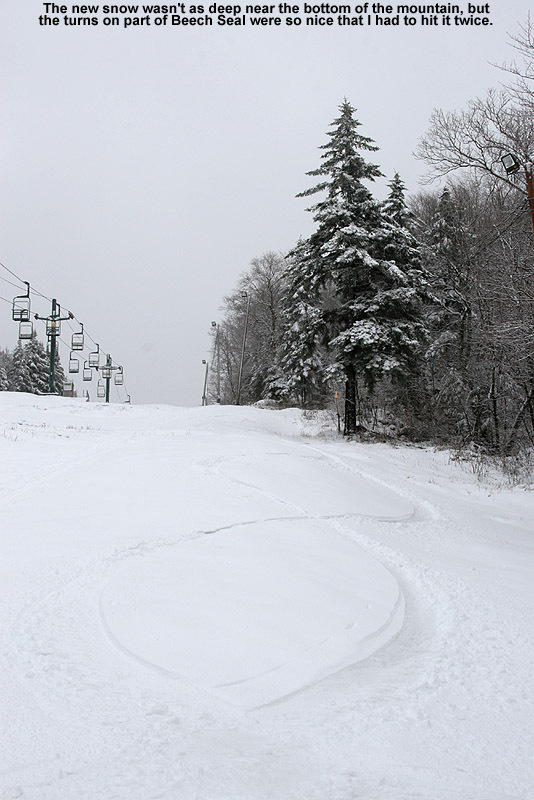 The prospects for some powder skiing were looking very good. There were about a half dozen cars in the parking area as I geared up and hopped onto the skin track at the east end. It was really more than a skin track; there had been enough use that the trail was essentially packed. It reminded me of a narrower version of the Bryant Trail at Bolton Valley. 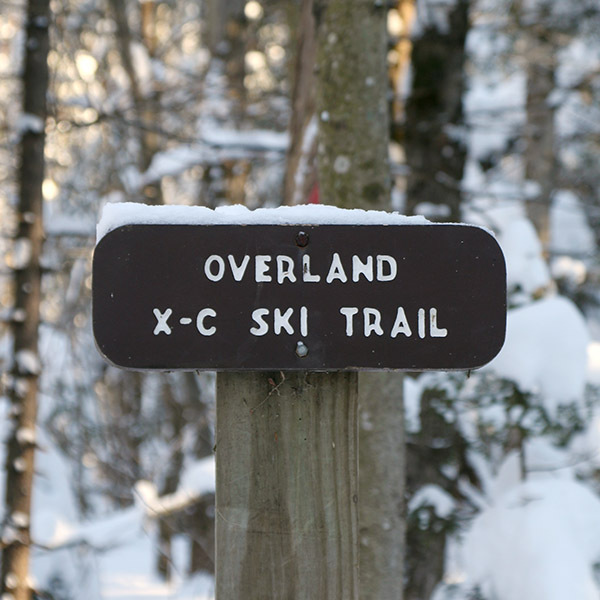 It wasn’t long before I came to a junction that gave me the option to follow either the Overland X-C Ski Trail or the Nebraska Notch Trail. My initial assessment of the area on Google Earth had me planning on the Overland side, and with the vast preponderance of skin traffic heading in that direction, it sealed the deal. 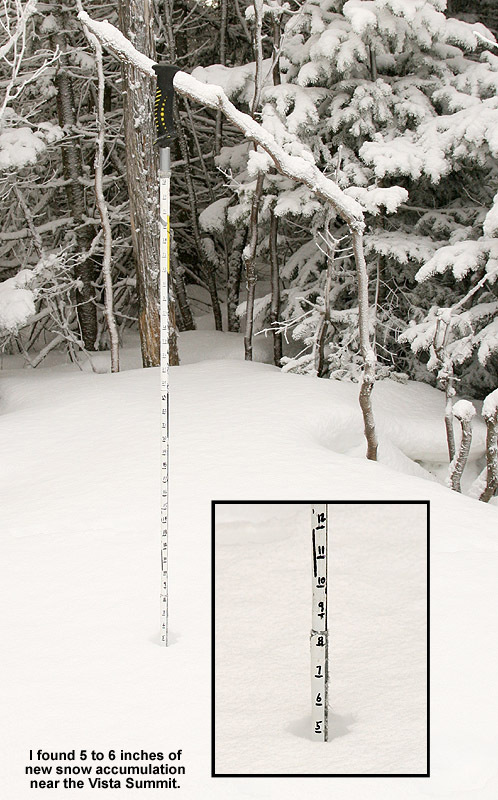 I did a few checks on the depth of the surface snow as I continued onward, and was getting measurements in the 15-16″ range. 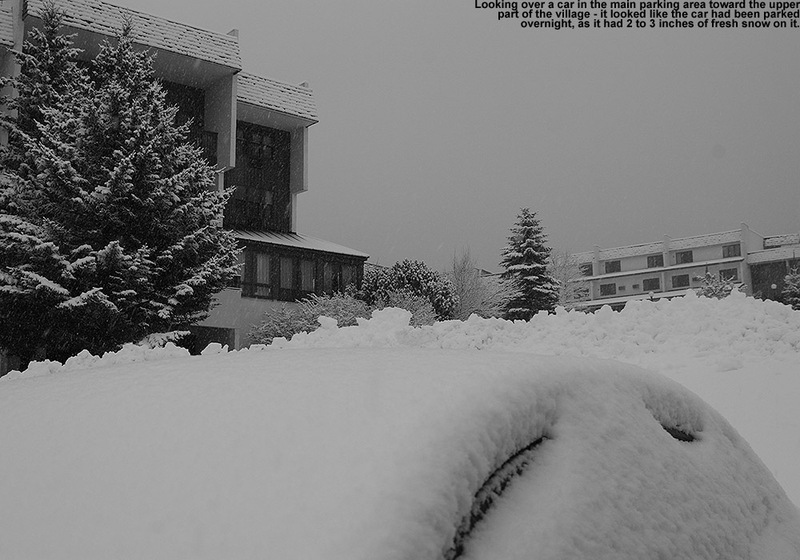 Even down in that 1,400′ to 1,500′ elevation range, the area had clearly been reeling in some good snows as of late. After about a half mile, the blazed Overland Trail seemed to head off to the north across the local streambed, but I stayed on straight ahead following the majority of the skin traffic. 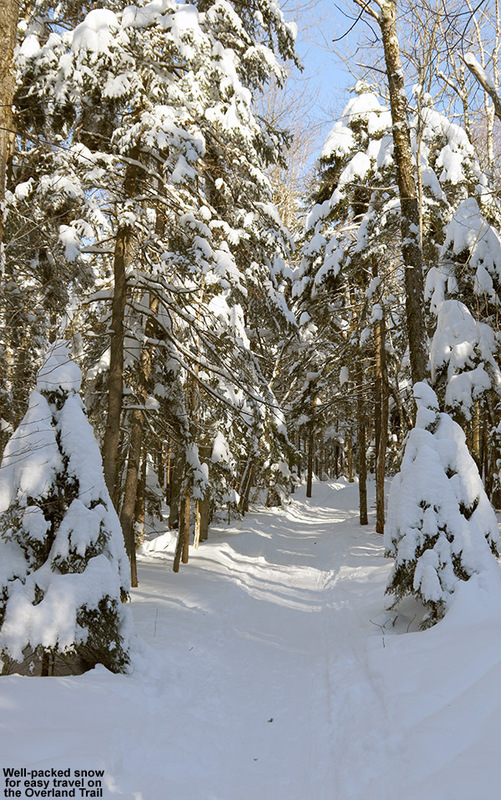 The skin track meandered upward through hardwoods, and I could see that people descending in the area would sometimes head off to the sides of the trail and ski the surrounding powdery terrain. 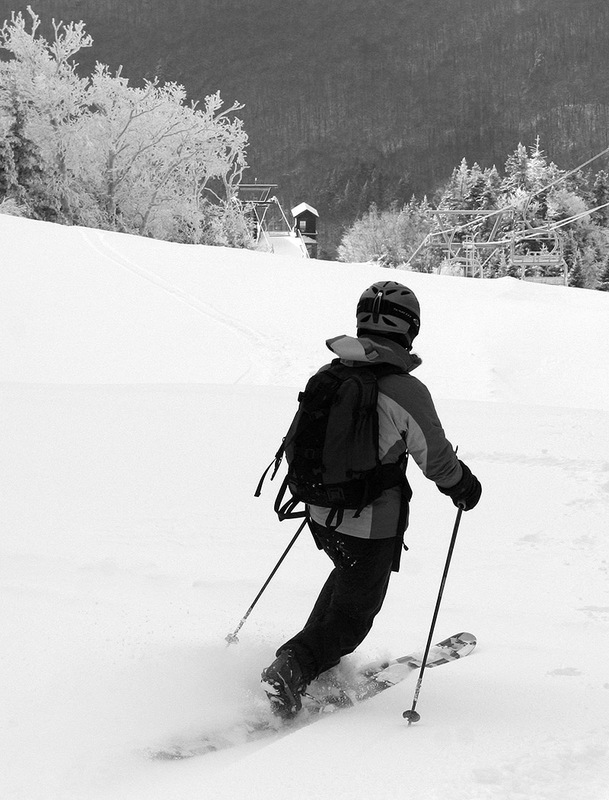 The skin track began to steepen, and at some point above the 2,000′ mark I began to get into more obvious glades. 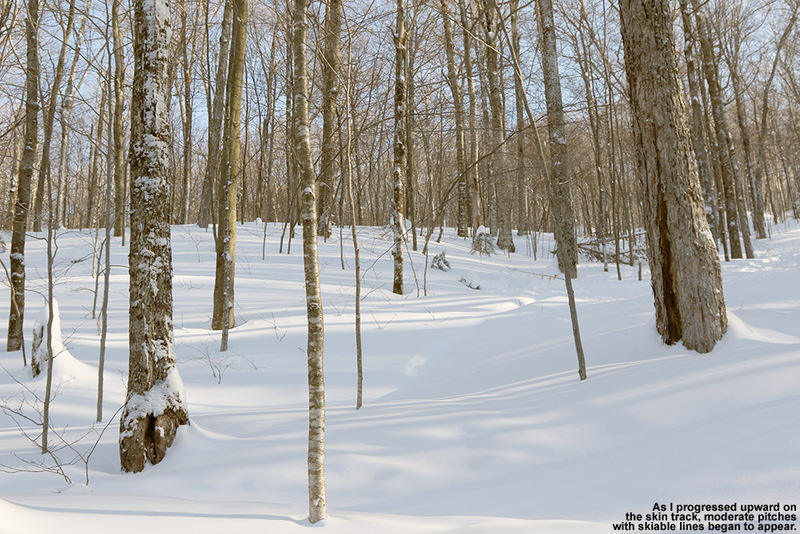 Based on the distribution of mature trees vs. hobblebush and striped maple saplings, it looked like the area had seen some pruning at some point in the past. 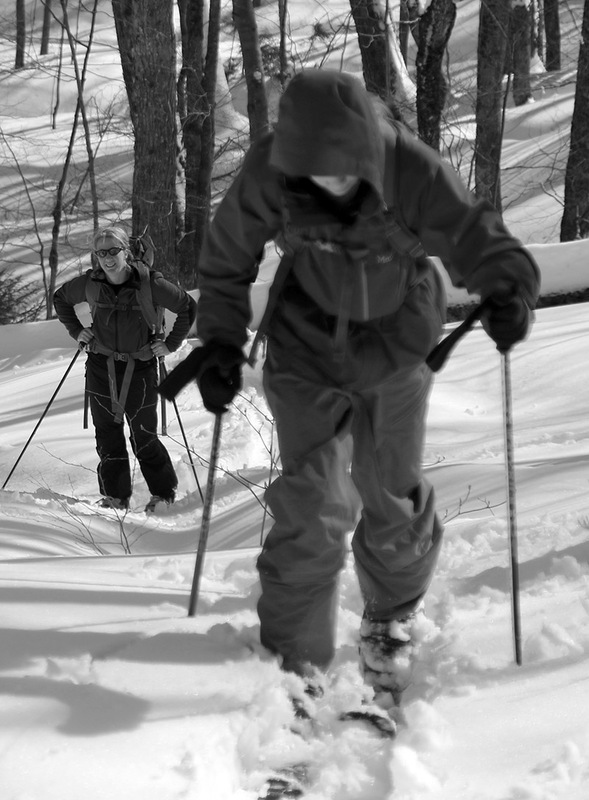 The skin track steepened further, and very obvious ski lines through glades with mature trees became more apparent. I caught sight of a couple of women who were ascending the skin track ahead of me, and eventually caught up to them at an elevation of around 2,700′ as they were switching over for a descent. We were just hitting the evergreen line, and I could see why they would start a descent there, but as I could also see a good number of ski tracks coming down from the evergreens above, I decided to push on a bit farther. 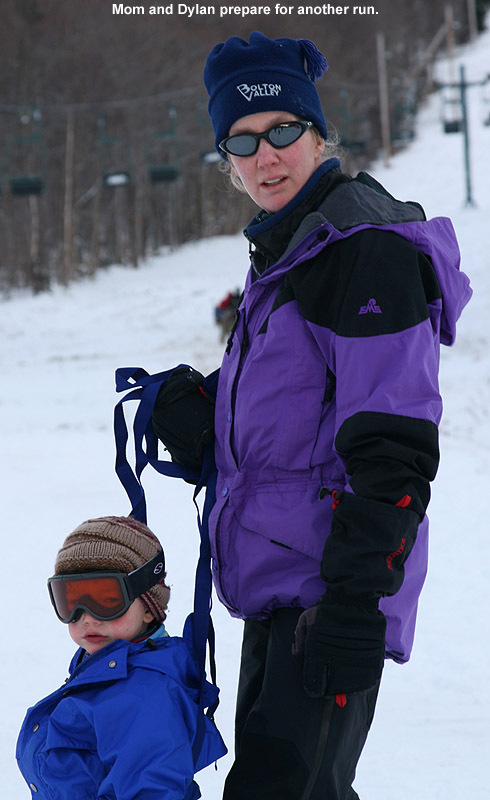 We exchanged greetings as I prepared to step up above the skin track to get around them, but they happily moved when they saw just how hard it was to step into the powder and go around the track. I was thankful to be able to use the track, because that powder was indeed deep – my checks were giving me measurements of 20-24″ of fluff. I continued on up into the evergreens for about another hundred vertical feet, following a mish mash of skin tracks and possibly descent tracks, until I found a nice spot to stop that looked like it would give me a good start to a run. I actually had a nice sheltered spot among some evergreens; it would have kept me well out of the wind, but I really hadn’t experienced any during the trip anyway. I poured some soup from my thermos to let it cool in the snow, and began the gear switch for the descent. It was definitely one of those “one skin at a time” types of transitions, as the powder was so light, fluffy, and deep, that it would be a hassle getting out of my skis entirely. I’m sure the temperature was somewhere below zero up there, and I made the switch to my heavier gear quickly before I began to cool down post-ascent. I had my soup, gathered my gear, and got set to push through the evergreens to look for a line. 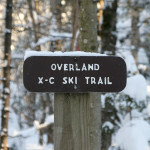 A little traversing through the evergreens was all it took, and I was into skiable terrain. 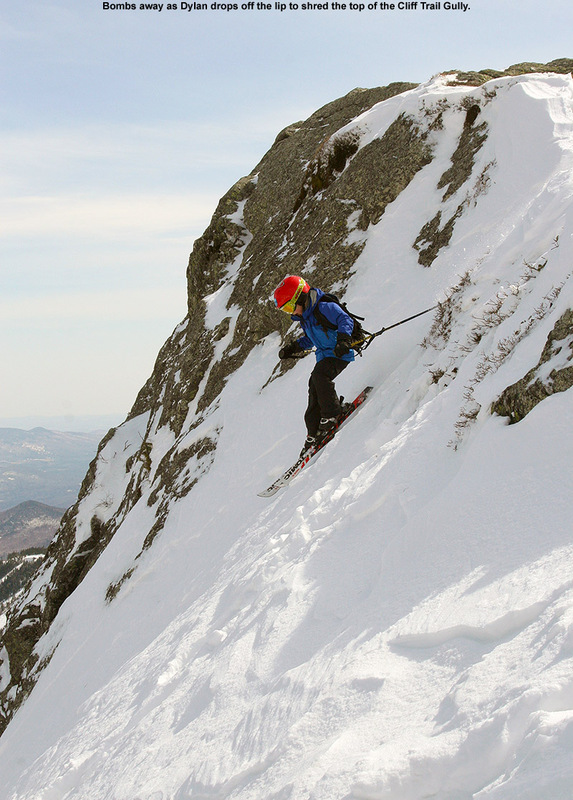 The best way to describe what’s up there is simply “steep and deep” terrain. It’s indeed steep, probably 25 degrees or so, and you really want the deep because it’s not the sort of terrain that would be great without sufficient snow – you’d be bottoming out all over the place. 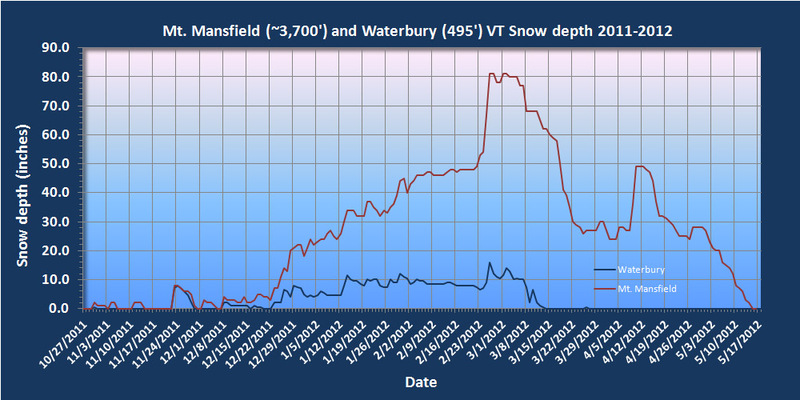 Fortunately, that’s not the case with the current snowpack. 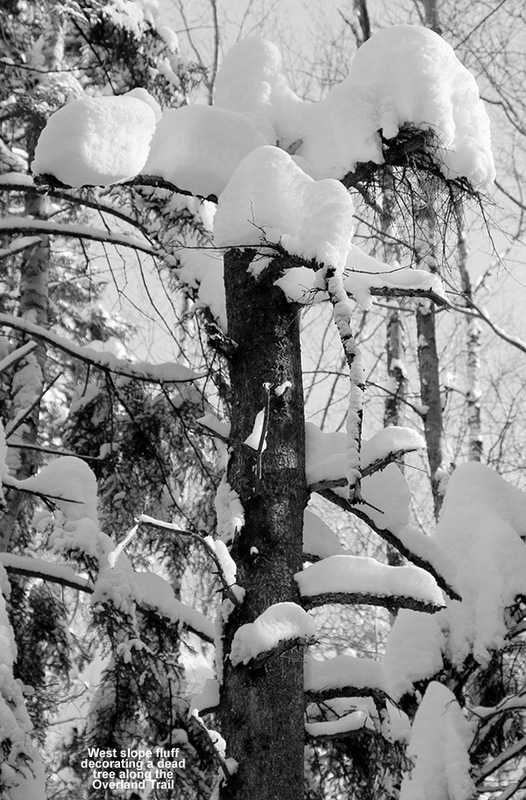 The roughly two feet of powder up there provided plenty of cushion, as well as resistance. 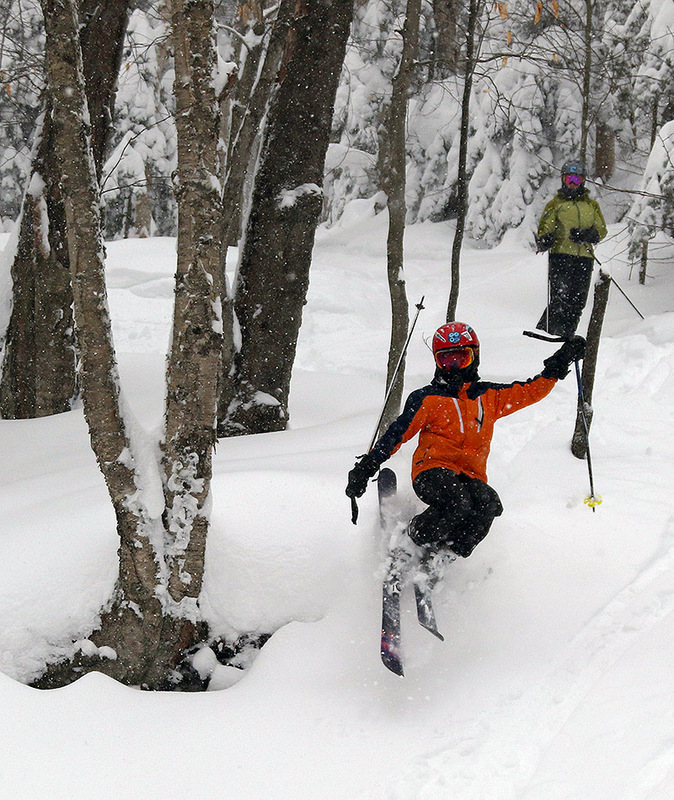 There’s plenty of spacing in the hardwoods, and you can open up the turns; even slower Telemark turns were comfortable thanks to the tree spacing and depth of the surface snow. 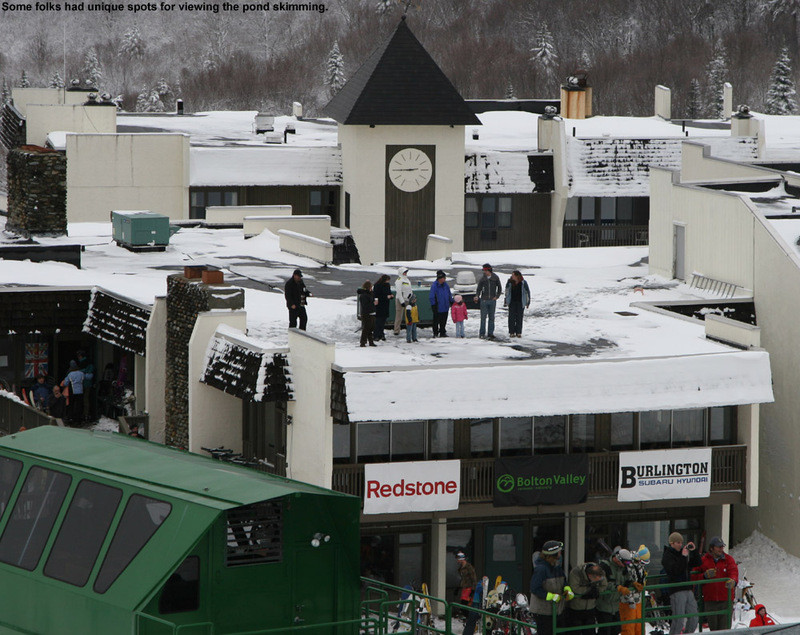 Well, some credit in that department is definitely due to fat, rockered skis as well. Also, any concerns about west side base depths was pretty much erased on this outing – if there were no concerns on that really steep terrain, it’s not an issue. The steep terrain goes on for several hundred vertical feet before it starts to become more moderate. I hung to the left and continued downward, eventually finding a popular catch track that actually headed up a short incline and off to the skier’s left away from the area of the skin track. I suspected that this would work in some additional lines down to the skin track, but available daylight and air temperature suggested that it would be best to save that exploration for another time. 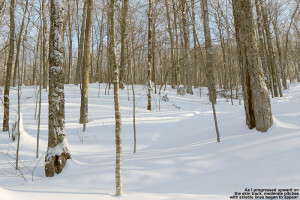 I headed down through the various trees around the area of the skin track, and there were plenty of additional turns to be made. Eventually as the pitch of the terrain became shallower, the Overland Trail itself was the most practical route, with just occasional forays off into the powder as speed allowed. 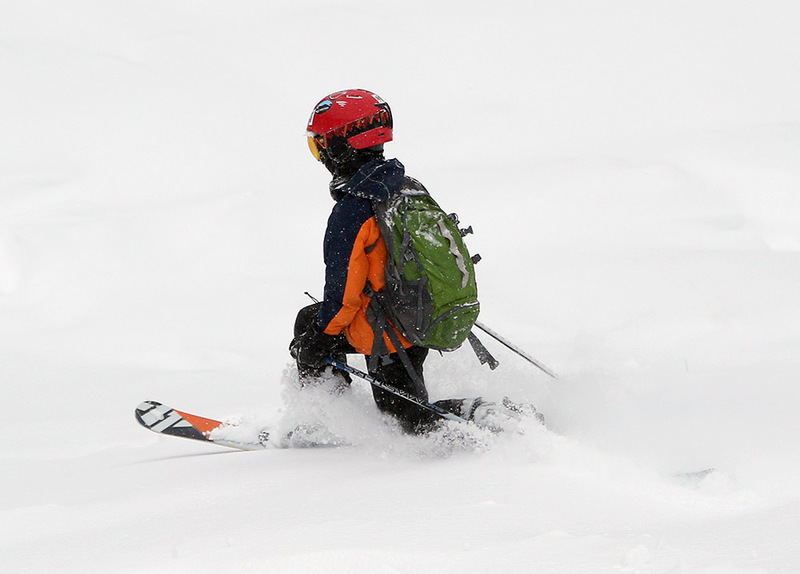 One nice aspect about the current snow conditions up there is that they allowed for good skiing in both the steep terrain, as well as the more moderate terrain below – the depth of the powder decreased pretty well in concert with the terrain’s pitch. 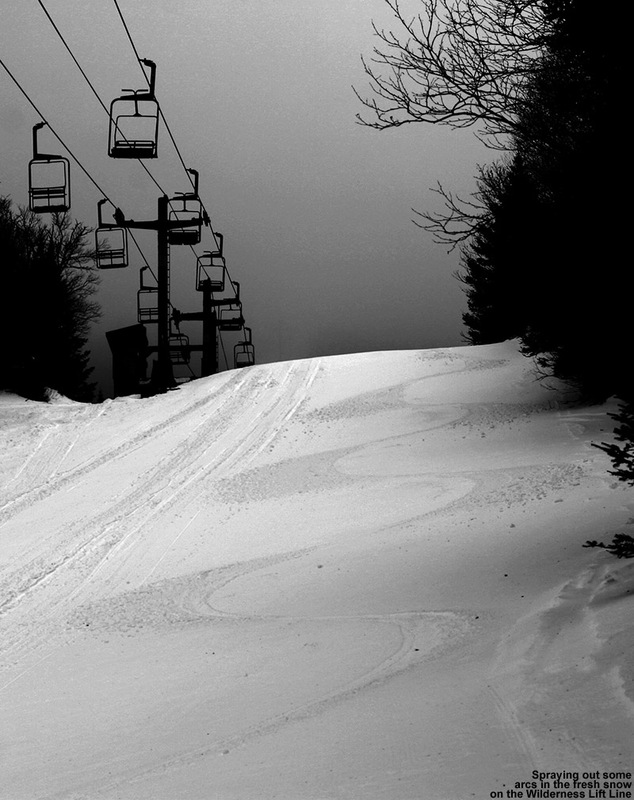 One could easily ski just some of the lower sections of terrain if the depth of powder didn’t suit the steep shots. In any event, thanks to the quality and depth of the snow, it was some pretty fantastic skiing for an exploration that started in a darkroom. I guess there might have been some nice symmetry to the report if I finished my run as darkness approached, but with these temperatures it’s not wise to push your luck being out there too late. 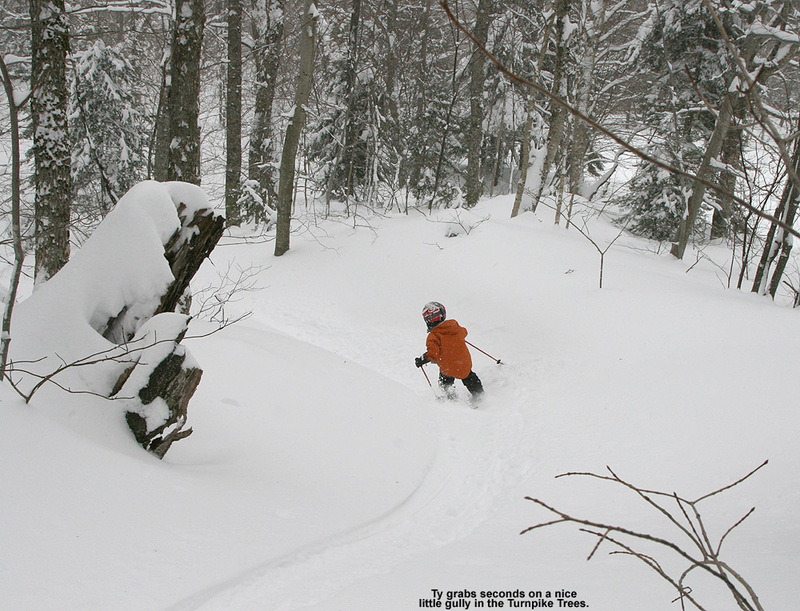 Enjoyed the ski summary – sounds like new deep snow is essential to enjoy the ride. The higher elevation terrain above 2,000′ or so is where that snow would be most important for optimal powder skiing if the subsurface was hard, but one could get by with less in the lower elevations where the pitches aren’t nearly as aggressive. 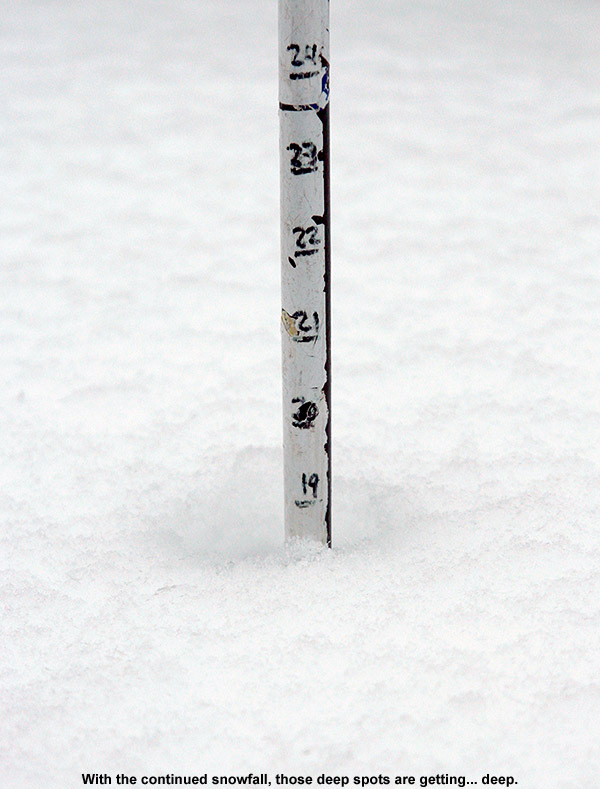 If it was very dense snow, a half foot would probably work on most of the area.